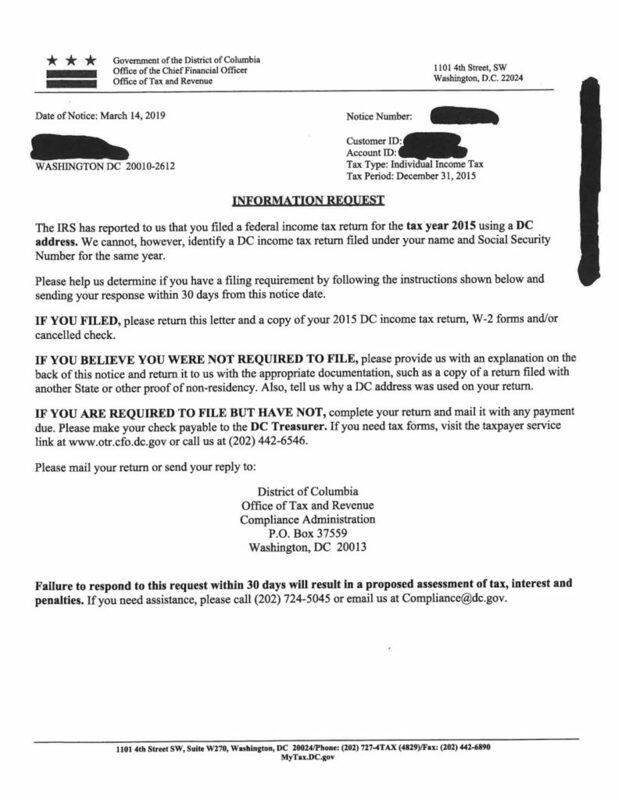 This weekend I received a bizarre notice from DC OTR saying that they have no record of my 2015 tax filings — and that I need to reply within 30 days with proof of my 2015 filing or face penalties, fines, and assessments. It seems that quite a few of our neighbors got a similar letter/notice from the DC OTR stating that OTR has no record of their DC tax return or payment from 2014 or 2015, that they should share their return and a canceled check with them as proof that of filing, and that there will be assessments and penalties if they don’t do this within 30 days. This many neighbors wouldn’t get such letters unless there was a problem. We definitely didn’t *all* forget to pay our DC taxes those years!